Chiropractic: Woo or Something More? Last month, a few fellow skeptics and I visited the Mind, Body and Spirit festival in Cork City Hall. It was quite an experience. There were shamans, psychics, angel healers, Scientologists, magic crystal sellers and prayer cults to mention a few. All flavours of the weird and wooful, along with plenty of people ready to part with large portions of their earnings to hear their dubious wisdom. It’s a bit like a visit to an expensive version of Harry Potter’s Diagon Alley, without the magic. Enough subject matter to keep us going for a year, without a doubt. I daresay we might talk about this further in future posts. Nested in the middle of the exhibition were a number of chiropractic booths. They were professionally laid out and populated by friendly people who were eager to help any people who came along. Chiropractic is described as “a primary health-care profession that specialises in the diagnosis, treatment and overall management of conditions that are due to problems with the joints, ligaments, tendons and nerves, especially related to the spine”. That sounds medical. So, what was it doing in the midst of shamans, faith healers and angel channellers? Chiropractic operates somewhat on the fringes of medicine. Some of its claims are pseudoscientific, such as the assertion by its founder that subluxations, or displacements in the vertebra, are responsible for 95% of all diseases. This is easy enough to refute, given that this statement seems to contradict all known studies into pathology, and to be fair, it may not accurately represent the philosophy of all modern chiropractic practitioners. 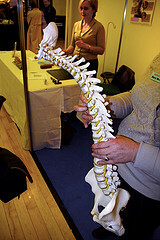 Nevertheless many chiropractors have made health claims that extend outside their field of study (e.g. infant colic), and this has resulted in unwanted media focus and significant damage to the profession’s reputation. In a famous case in 2008, the British Chiropractic Association sued the writer Simon Singh for declaring such treatments “bogus” in a newspaper (they withdrew the claim in 2010 when Singh won right of appeal). In addition, the evidence produced by the BCA to support their main claims was shown to be scientifically questionable. There remains a significant burden of proof on chiropractors to demonstrate that many of their treatments work above what might be expected from normal healing processes. Nevertheless, back pain is real. It’s a grinding, soul destroying problem afflicting a large percentage of people in the community at any time. It can often take a long time to resolve, even with the best medical treatment. There is certainly a case to be made for qualified caregivers to assist people through recovery using a variety of techniques such as advice, counseling, exercise, relaxation and massage, in addition to the normal medical pain management solutions. A visit to someone who will take the time to listen and give sensible suggestions on lifestyle changes to accelerate the healing process is unlikely to be detrimental. It is probably the case that most chiropractors take the problems of their patients very seriously. It is also probably the case that an earnest chiropractor will look beyond the nonsense of subluxations and into the realm of hard medical facts when seeing ways to provide pain management solutions to clients. If chiropractors are seeking a “total solution” to patient wellbeing, then it would seem remiss not to include medical treatment in their toolkit of methods used to help patients. Many patients report improvements after visits to chiropractors, whether this be real or perceived. Indeed, many people who go to chiropractors defend them quite vigorously. The bottom line is that there appears to be a strong need in the community for such care, even if it is debatable how effective this care may be. If professional caregivers are available to help people get through a period of back pain, if the patient is properly informed and if science is central to the treatment process, I’m not sure if this is something I would have much of a disagreement with. The issues I would have is with supposed remedies that are not backed up by any form of objective study, where treatments are being used that have little or no plausibility or evidence of efficacy, where the healthcare is spilling over into fields that have nothing to do with back-pain, where some practices involved are needlessly harmful, or where practitioners are trying their best to blacken scientific and medical knowledge in order to make patients more dependent on their own treatments or other alternative treatments. These issues are at the centre of many objections by skeptics. This brings me back to my opening question. Where do chiropractors want to see themselves? If they truly see themselves as important primary care givers, then why maintain the attachment to pseudoscience? Why attend conferences with psychics, angel channelers and faith healers? Is it a marketing or a branding thing? Are such associations beneficial? Do chiropractors prefer to remain in the medical twilight zone, or do they wish to be seen as proper adjunct health-care professionals meeting what is certainly a need in the community? Categories: Alt Med | Tags: back pain, British Chiropractic Association, chiropractic, chiropractors, healthcare, sceptic, skeptic, spinal manipulation | Permalink. This is the biggest surprise I have had so far, since starting to attend the skeptics meetings. I would have never have put Chiropractics in the same boat as Scientology. What a huge surprise that they verge on quakery! Especially considering that if I was to use a chiropractor, according to my health policy I can claim back some of the cost??? The reality is that Chiropractors attend these type of exhibitions to get out and meet the community. Whether it be a mind body and spirit exhibition, a modern homes exhibition or a garden show. The profession in this country, at a skilled and university trained level, is still very new, so these shows allow people to meet Chiropractors and gain an understanding of what we can atually do. The majority of the population don’t realise the extent of what chiropractic deals with and more importantly the amount of university training required to call yourself a Dr of Chiropractic. This is not a ‘quack’ course in ‘snapping’ backs nor is it a weekend FAS course, as I have been asked in the past, this is a minimum of 5 years full time univeristy education, at a medical and research based training facility. 1) where treatments are being used that have little or no plausibility or evidence of efficacy- if you see that a condition has responded to care that you have provided regardless of ‘researched efficacy,’ is this not a good thing? Do you wish for babies to suffer needlessly from colic? As long as no promises are made to the patient and that you are upfront with them when you offer them care options, surely giving some kind of hope is better than sending them away in pain and telling them that you have no ‘research’ to back up your care so they should just suffer! 2) where the healthcare is spilling over into fields that have nothing to do with back-pain- if a patient comes in for back pain and as a direct result of the care provided they gain other improvements in their health, again I don’t see why you would not wish this for people suffering! 4) where practitioners are trying their best to blacken scientific and medical knowledge in order to make patients more dependent on their own treatments or other alternative treatments- this is simply unethical, and to tarnish all complementary medicines with this brush is unprofessional on your behalf. You need to trust that each individual practitioner has the best interest of the patient at heart, and if they don’t maybe they should be doing something else. The fact is, this could be said about any profession, whether is be mechanics, builders or salespeople. Your statement comes down to ethics of the individual, not the profession as a whole. Furthermore, it could be argued that the medical profession prescribing meds could be construed as ‘making patients dependent on their treatments’ rather than looking to solve the cause of the problem in the first place. I appreciate that it’s all part of an approach to reach out to a community of people, but my big concern upon visiting this show was that a lot of the stands there fell far short of what I would call helping people in any meaningful way. I’m sure a lot of other caring professions would be happy get out into the community: doctors, physiotherapists, psychiatrists, counsellors, and yet they were notable by their absence. I don’t see how it benefits your profession to be associated with some of the rank pseudoscience on display elsewhere. When it comes to infant colic, my point is that parents should be given access to the best research that is out there, even if that research has not yet lead to any firm conclusions. When approaches are suggested that don’t have the research to back them up or where the research suggests they are no better than placebo, then fine, I’m not saying don’t do it – but it’s no better than my auntie suggesting something either, or something that you might read in a magazine. I’m not sure whether I should be paying a lot for it if that’s all there is. The issue of spill-over is that the Chiropractic profession claim benefits that have no plausible mechanism for action, and furthermore which have no evidence of efficacy beyond placebo. If you can’t prove efficacy beyond placebo you have nothing much to support that claim beyond anecdotes. And yes: this might make some people feel better, but it runs the risk of people being given advice or treatment that diverts them away from a serious underlying problem that may require fast medical intervention. There are of course many options that practitioners can take where people are suffering: finding experts in that field who might be able to help, looking up advice and literature yourself where appropriate, giving general advice about how patients can look after themselves during recuperation. My point about needlessly harmful referred in particular to treatments such as strong physical neck manipulation employed by some chiropractors, which has in some cases, resulted in strokes. On a side point, I would be just as appalled if a medical treatment was causing needless harm while not delivering any worthwhile benefits. In fact I would go further. I wouldn’t be happy with any treatment, medical and alternative, that does not deliver worthwhile benefits whether harm is caused or not. As regards point 4 – you missed the point I was making. I did not say that all practitioners were doing it. I did not tarnish all complementary medicine practitioners with this brush at all. What I said was that on the occasions where this happens it is objectionable, and, as you say, unethical. From what you have written, I don’t think we differ on this point at all. On your point of the medical profession prescribing meds to create a dependency culture, it comes down to whether there are realistic alternatives – I expect you are not saying that the entire medical profession are guilty of this either? The overall point I am making is that I do see a need for longer-term health-care which doesn’t necessarily involve running to the doctor every time, but that it should be based on the best research and the best knowledge at all times.